Fireside Chat- May 2011 – I Love It Spicy! This is the area where you can chat about almost anything that you do not have the convenience to talk about with the other threads. Here you can vent, de-stress, air your grievances or just connect with others. Feel free to make yourself at home, but keep it clean and do not attack your fellow chilehead. These attacks will not be tolerated. So play nice and have fun. Thanks for coming by. 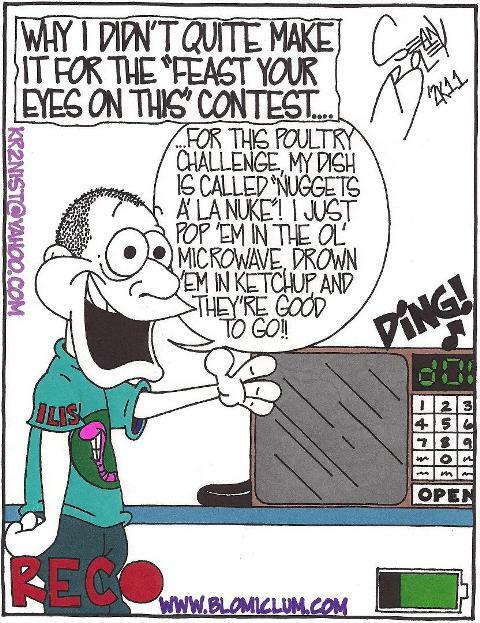 The cartoon is reminiscent of Jim Campbell’s chipotle nuggets recipe, except use a crock pot instead of a microwave! If you have had the Mild to Wild Chipotle BBQ sauce, then you have your answer. So he can go shopping once every 5 years and be good. Wow…I just cannot imagine. No fresh fruits or veggies? or a fruit sauce depending who you are asking. Hey Boobie I finally figured out how to play poker. Let’s go to Vegas! Oh where Oh where can he be? Just wondering if anybody knows where homonculus could be. He was spotted in Fairfield Ohio a couple years ago and I heard he stowed away on a flight to Arizona. Then he supposedly made his way Down Under. Anybody spotted him anywhere? Here he is at Jungle Jims. well I’m hoping that’s Golden, Colorado cause he likes Coors Light! Just letting everyone know I still have lots of plants left to sell. I have Butch T Scorpion, Moruga Scorpion, 7 Pot Jonah, Yellow 7 Pot, Bhut Jolokia, Chocolate Bhut Jolokia, Yellow Bhut Jolokia, Malaysian Goronong and many more. Do not take less than $12 a pound for superhots. You could sell a single fresh pepper for $1 or 10 for $5 be creative! Sounds good Jim, thanks for the feedback. Excitement is building about the Scorpion and 7-pot varieties with my customers, can’t wait to try them myself.